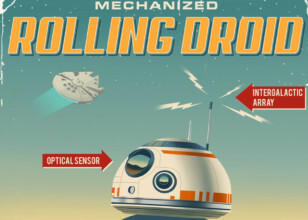 Rolling Droid is a Steve Thomas artwork featuring the newest Star Wars introduction from The Force Awakens, episode seven of the film franchise. BB-8 was an astromech droid who operated approximately thirty years after the Battle of Endor. The droid was at one point operating in the dessert of the planet Jakku. 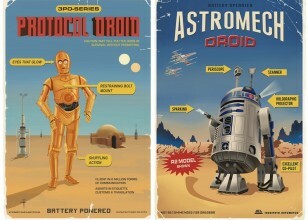 It had a domed head, similar to that of R2 series of droids, with the bulk of its body made up of a ball that the droid rolled on. BB-8 was mostly white, with some silver and orange on its body, as well as a black eye-piece. The droid belonged to Resistance pilot Poe Dameron, and thus was able to fit into a T-70 X-wine fighter's droid socket. 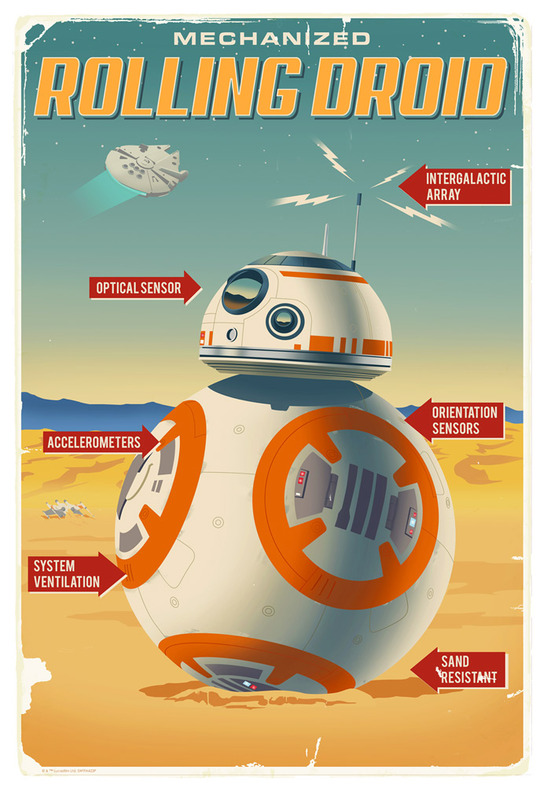 Click here for more information about BB-8! Star Wars: The Force Awakens was widely anticipated, and Disney backed the film with extensive marketing campaigns. It premiered in Los Angeles on December 14, 2015, four days before its wide release worldwide. 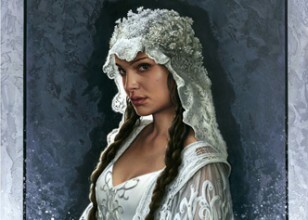 The film received positive reviews, with its ensemble cast, direction, musical score, and action sequences receiving particular praise, though some fans criticized it as too derivative of the original trilogy. The film broke various box office records and became the highest-grossing installment in the franchise, the highest-grossing film in North America unadjusted for inflation, and the third-highest-grossing film of all time, with a worldwide gross of over $2 billion and ended up yielding a profit of over $780 million net for the company. It received five Academy Award nominations and four British Academy Film Award nominations, where it won Best Special Visual Effects. Two sequels, Episode VIII and Episode IX, are scheduled for 2017 and 2019.